We Need Relief… | The Happy Wonderer ~ ellen b. …from our smoke filled skies. Praying our fires are contained and no new fires start. 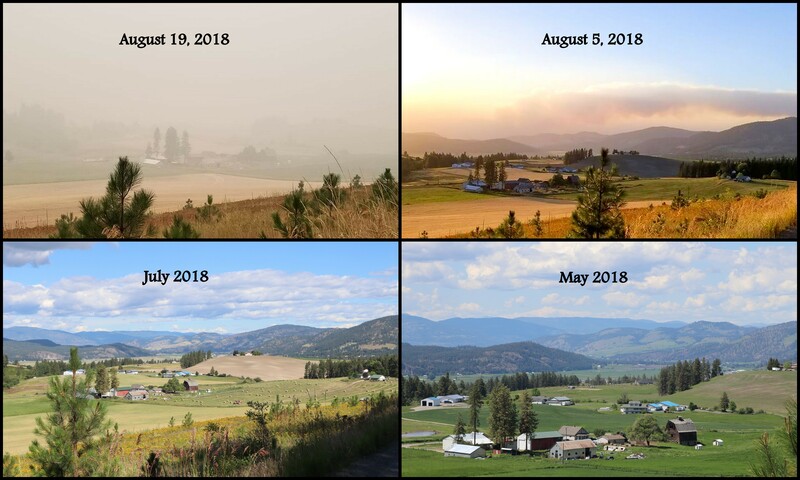 We left Colville this morning and we had smoke filled skies all across eastern Washington, central Washington, over the Cascade mountain range and into Western Washington. It’s sad to see so much smoke. It also is hard on the eyes, throat, lungs and sinuses. Looking forward to clear skies ahead. Posted on August 19, 2018 by Ellen •	This entry was posted in Travel, Washington State and tagged 2018 Fires. Bookmark the permalink. Hello, these wildfires are awful. The smoke filled skies are harmful too. I hope you get some relief and rain soon. Happy Monday, enjoy your day and the new week ahead! …I wish that I could help! It is indeed hard when the smoke fills up where you live and there’s just no getting away from it. We have been spared that (so far) this summer in Florida, but during our last several years in Colorado, we sometimes had orange skies up overhead from all of the smoke. It was downright eerie! Joining you in prayers for relief! Oh, the smoke is dreadful. It’s now mid-afternoon and quite warm, but I don’t want to open up the house because the smoke will be worse. We are praying for rain and for these fires to be dampened. Hang in there. Ellen – we can relate. Things were hazy and smoky before we went to Colorado for 5 days – a pleasant change of pace/air – but we have returned today to much the same conditions. Some hope in sight with a half inch of rain that fell last night, and with more in the forecast by the weekend. Praying things will get better for you soon. Wow – this is just so sad. Praying for thirst quenching rain and moisture … stay safe my friend! All the terrible fires in the west have really taken a toll. I’ve heard smoke has even reached the east coast. We had a good rain today so hopefully, our air will be clearer tomorrow.